This simply exquisite 9 carat white gold ring features a solitaire stone and diamond set shoulders, making the stone the focal point of the whole ring. Its diamond set shoulders add a modern element to this otherwise classic and timeless piece. 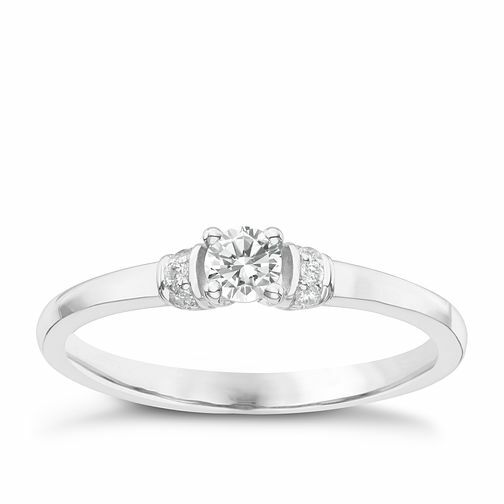 9ct White Gold Diamond Solitaire Ring is rated 4.5 out of 5 by 2. Rated 4 out of 5 by Anonymous from Engagement ring Well she said yes and seems to love it, so did the job. Diamond is small but thats what my GF prefers. Comes with a decent box. Rated 5 out of 5 by Anonymous from Beautiful delicate ring Lovely engagement ring. Very delicate stones and band - tasteful and classy. The setting is a little different from the usual solitaire.